This year, one in every twenty Americans will walk into a medical clinic and receive the wrong diagnosis. That’s more than 10 million people, and for half of them, the misdiagnosis could be harmful, a 2014 study in the British Medical Journal concluded. Doctors try to be systematic when identifying illness and disease, but they’re only human. Bias creeps in. Alternatives are overlooked. With a paper published today in Nature Medicine, a group of researchers from universities in the U.S. and China tested a potential remedy: artificial intelligence. The researchers built a system that automatically diagnoses common childhood conditions — from influenza to meningitis — after reading a patient’s symptoms, medical history, lab results and other clinical data. The system was highly accurate, and one day could assist doctors in diagnosing patients with complex or rare conditions, the researchers said. The system relies on a neural network, a breed of artificial intelligence that can learn tasks by analyzing vast amounts of data. 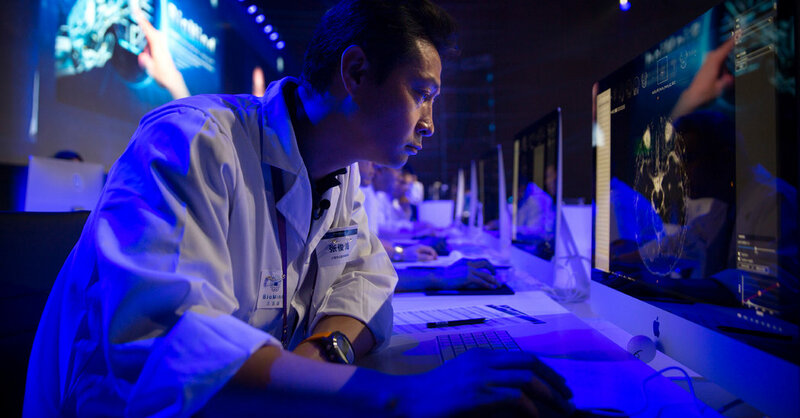 In this case, it analyzed electronic health records from more than 1.3 million patient visits to a pediatric hospital in China, learning to associate common medical conditions with specific patient information gathered by doctors, nurses and other technicians. The same “deep learning” technology underpins everything from Google Translate (a smartphone app that translates between languages) to Amazon Alexa (a coffee-table gadget that recognizes voice commands from across the living room). After reshaping internet services, consumer devices and driverless cars in the early part of the decade, the technique is now moving into health care. Many organizations, including Google, are developing and testing systems that analyze electronic health records, in an effort to flag potential medical conditions such as osteoporosis, diabetes, hypertension and heart failure. Similar technologies are being built to automatically detect signs of illness and disease in X-rays, MRIs and eye scans. Able to recognize patterns in data that humans could never identify on their own, neural networks can be enormously powerful in the right situation. But even experts have difficulty understanding why such networks make particular decisions. As a result, extensive testing is needed to reassure both doctors and patients that these systems are reliable. It could be years before deep-learning systems are deployed in emergency rooms and clinics. But some are closer to real-world use. Google is now running clinical trials of its eye-scan system at two hospitals in southern India. Deep-learning diagnostic tools are more likely to flourish in countries outside the U.S., Dr. Zhang said. Automated screening systems may be particularly useful in places where doctors are scarce. The system built by Dr. Zhang and his colleagues benefited from the enormousness of the data set gathered from the hospital in Guangzhou. Similar data sets from U.S. hospitals are typically smaller, both because the average American hospital is smaller, and because regulations make it difficult to pool data from multiple facilities. Moreover, privacy norms are less stringent in China than in the U.S. and Europe. “China does not have nearly the same obstacles,” Dr. Topol said. Dr. Zhang said he and his colleagues were careful to protect patient privacy when gathering data for their new system. But he acknowledged that researchers in China may have an advantage when it comes to collecting and analyzing this kind of data. “The sheer size of the population — the sheer size of the data — is a big difference,” he said.